Then the vibration began. Lily didn't know if it was a sound, a sensations, or something in between, but a steady thrumming became her only focus in the voice. It was a distinct patter, a unique combination of rhythm, intensity, pitch, and duration that was as recognizable as a friend's voice. It was a song without notes, as complex as a symphony, and startlingly beautiful. It ended and another began. The second vibration was as unique and as infinitely complicated as the first, and it ended just as abruptly. "I can't believe you're the same guy who peed on my head a few hours ago." "I didn't pee on your head! I did it in the cauldron," he said, laugh, which was exactly what Lily had intended. It hurt to see Rowan that sad. "Six of one, half a dozen of the other," she said wryly, waving off his protestations. "All I know is that you cut off all my hair and dyed it who-knows-what-color, and you used your pee to do it." "Have you ever heard the saying, 'Whatever doesn't kill you makes you stronger'?" Carrick asked. Lily nodded desperately, hoping for any way to relate to him, to reach out to his humanity. "It's a lie," he said quietly. "There are things that a person can live through that make him weaker. Things that can leave you less than you were before. Maybe you're about to experience one of them." Suffering descended on Lily like a claw from the sky. Oh. My. God. Everything and more. Trial by Fire is everything and more. 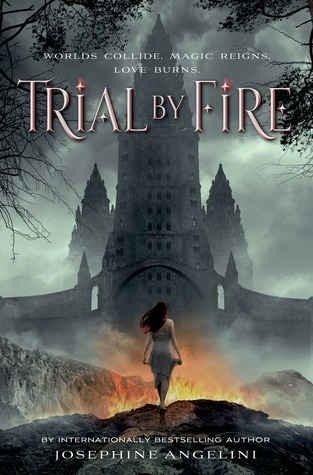 I started Trial by Fire over July 4th weekend and thank goodness I did because I was not able to put it down! Lily Proctor has severe allergies to many things around her - almost everything really - and has resigned herself to life of no friends (save Tristan and her sister, Juliet), an eventual bubble, a crazy mother, and an absentee father. She has come to accept this as her life until one night when everything falls apart and she is pulled into New Salem. New Salem is an alternate Salem (there are infinite universes and this is just one of them) run by Lillian Proctor, the Lady of Salem. The world Josephine has created is, for lack of better words, magical. She has create a place where magic is a commonly used amenity, there are thirteen cities / covens, and is an interesting mixture of the historical, modern, and futuristic, where science is outlawed and punishable by hanging. After running from Lillian, Lily finds herself teamed up with Rowan (swoon), an alternate Tristan, and Caleb. These three are part of a larger group called Outlanders that is comprised of those who have been banished from Salem to live in the wilderness surround by Woven, genetic mistakes that consist of a variety of animals and insects that pray on humans, and are asking for nothing more than to be treated as equals and have a voice. I enjoy the juxtaposition of Lily verse Lillian. While they look exactly the same and hold many similar attributes (stubbornness and dedication among them), Josephine makes them their own person. There are things Lillian does that Lily would never dream of and times when Lillian thinks Lily is being weak. I love that Josephine approached this as if saying "Yes, they are both Lillian Proctor, but there is a huge difference between Lillian and Lily." And Rowan. I could get lost in Rowan. He's guarded from Lily, due to Lillian's actions (don't worry, the Lily / Lillian thing isn't confusing), but tries to remind himself that they are two different people. He trains Lily in the way of magic and protects her from both Lillian and those that wish Lily harm. Due to the nature of their relationship, their romance is one of my favorite kind: slow burn! As readers we see their romance slowly, almost painfully slow, develop over the course of the book making it real and true. I cannot say enough good things about Trial by Fire. The characters are amazing, the world building incredible, and the romance spot on. Josephine has created a wonderful book that will keep me coming back and hungering for more.